Need To Liven Up Your Yard? Is your yard looking sad? Is it mostly brown and just unhealthy looking? Want a way to brighten it up while doing virtually no yardwork? Then Hutcheson Horticulture has the solution for you! It is called floriculture, and it is the cultivation of flowers, by definition. With their vibrant colors, textures, and fragrances, it is no wonder flower cultivation is one of our most popular enhancements! 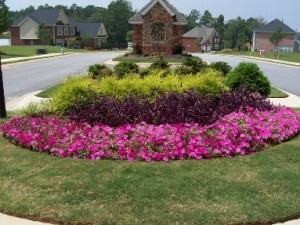 We cater to the needs and wants of each individual customer and can help with large perennial gardens, or annual beds with many colored flowers. Our experts can and will take care of it all! All you have to do is call, and tell them what you want! If a large bed of perennials is more your cup of tea, we completely understand. Perennials can be a great option for those who do not necessarily want the hassle of planting every year. We will help you with anything we can! So, remember, a flower garden is a great way to liven up an otherwise sad yard, and we are just the people to help you with it! To request more information, or schedule an appointment with our floriculture team, contact us at: color@hutchhort.com or simply call us at (770) 924-1001. Also, make sure to follow us on our other social channels: Facebook, and Twitter!